Donation encouraged. Pizza donated by Two Boots. Inspired by the different descriptions Steve Cannon’s visitors would give of the art on the walls, and by taking the blind professor to art openings, curator Janet Bruesselbach organized an elaborate art and writing project between 13 artists and writers. It aims to consider the subjectivity of attentive visuality in art writing and the absurdity of symbolic imagery. The first stage of translation from visual to verbal varies hugely in style and focus, even given stylistic restrictions. The artist's job is even harder and even more subject to the variations of personality and style. Not only was it hard to communicate the most basic aspects of artwork or even the rules of the game, the variations in series are indescribable. The resulting illustration of mis/communication varies from wondrous to farcical and demonstrates the impossibility of translation. 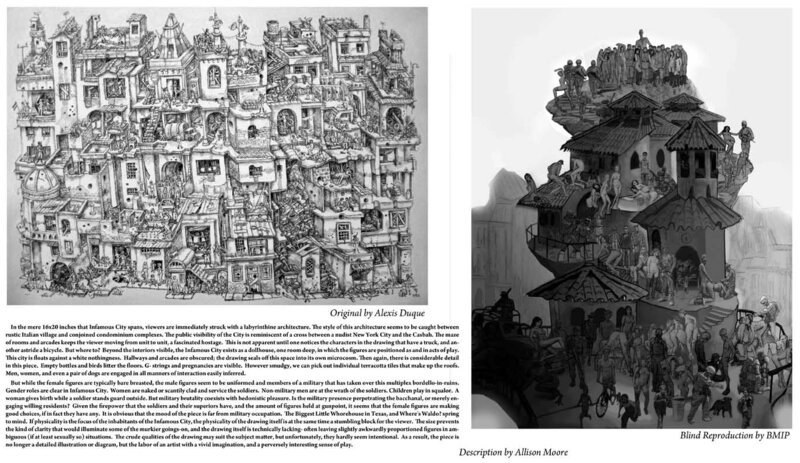 Original acrylic painting by Alexis Duque, interpreted by BMIP in digital drawing collage from Allison Moore's writing. 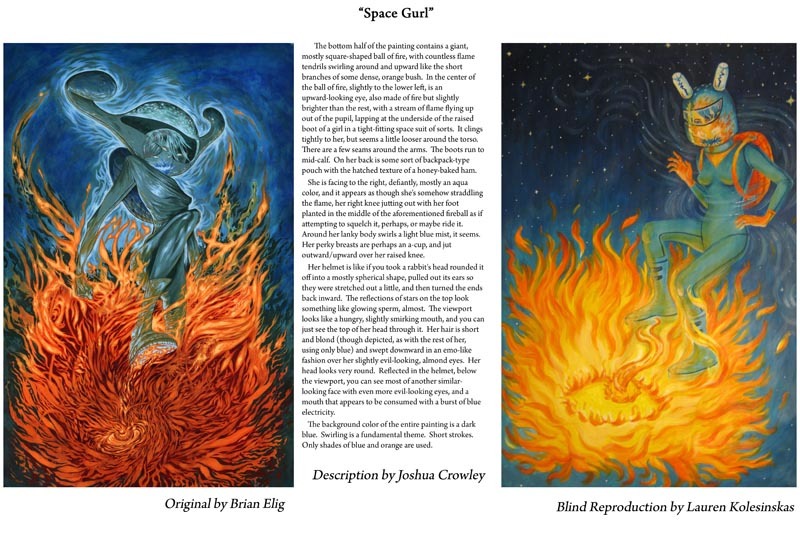 Space Gurl: original by Brian Elig, description by Joshua Crowley, and blind reproduction by Lauren Kolesinskas. Signed by all three. 19 x 13 inch archival print. 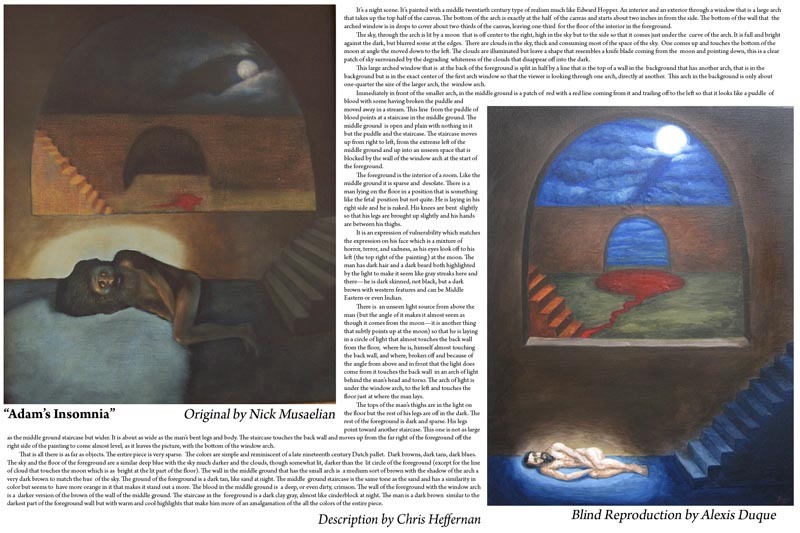 Adam's Insomnia: original by Nick Musaelian, description by Chris Heffernan, and blind reproduction by Alexis Duque. Signed by Heffernan. 19 x 13 inch archival print. 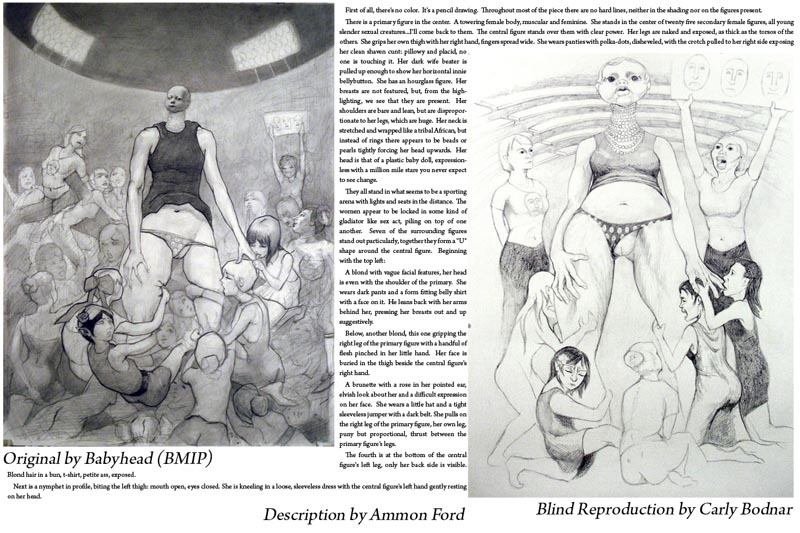 Babyhead: original by Isaac Pelepko, description by Ammon Ford, and blind reproduction by Carly Bodnar. Signed by Bodnar. 19 x 13 inch archival print. 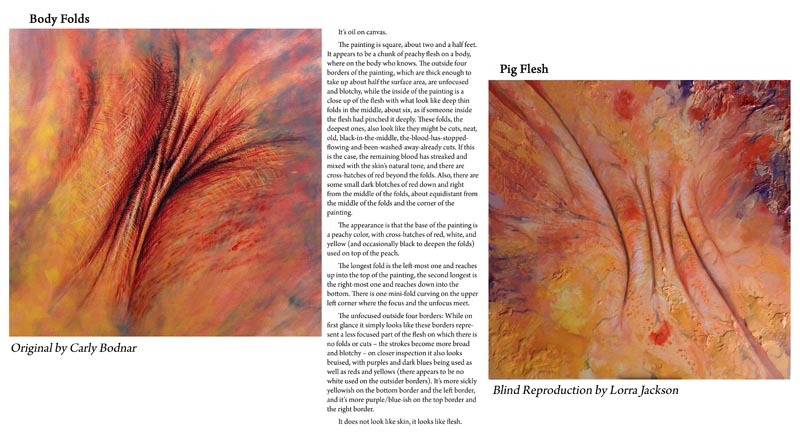 Bodyfolds: original by Carly Bodnar, description by Casey Plett, and blind reproduction by Lorra Jackson. Signed by Bodnar and Jackson. 19 x 13 inch archival print. 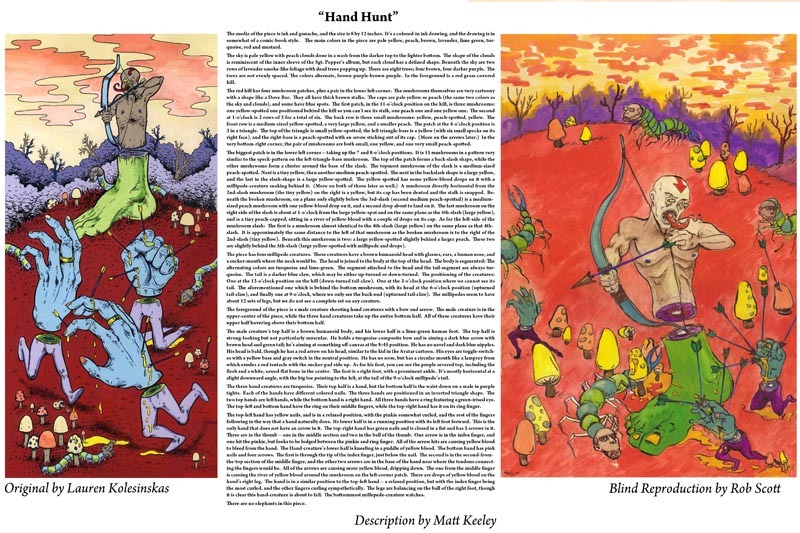 Hand Hunt: original by Lauren Kolesinskas, description by Matt Keeley, and blind reproduction by Robert Scott. Signed by Kolesinskas and Scott. 19 x 13 inch archival print. 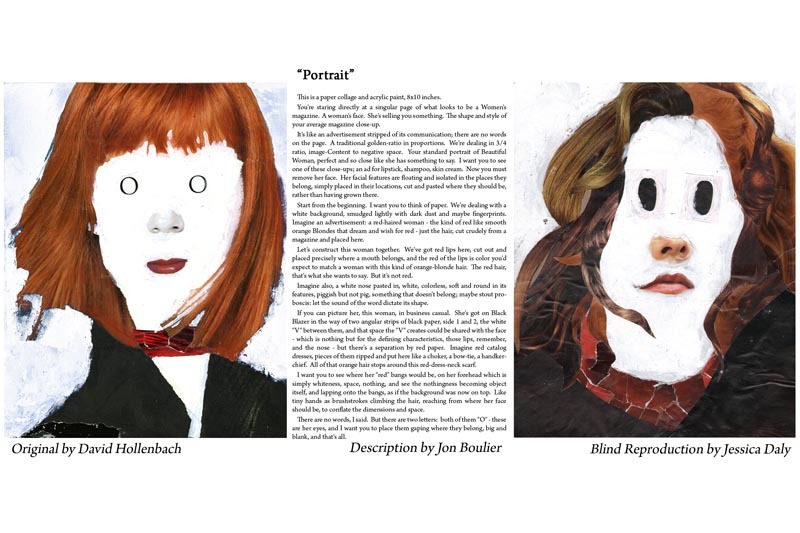 Portrait: original by David Hollenbach, description by Jon Boulier, and blind reproduction by Jessica Daly. Signed by Hollenbach and Daly. 19 x 13 inch archival print. 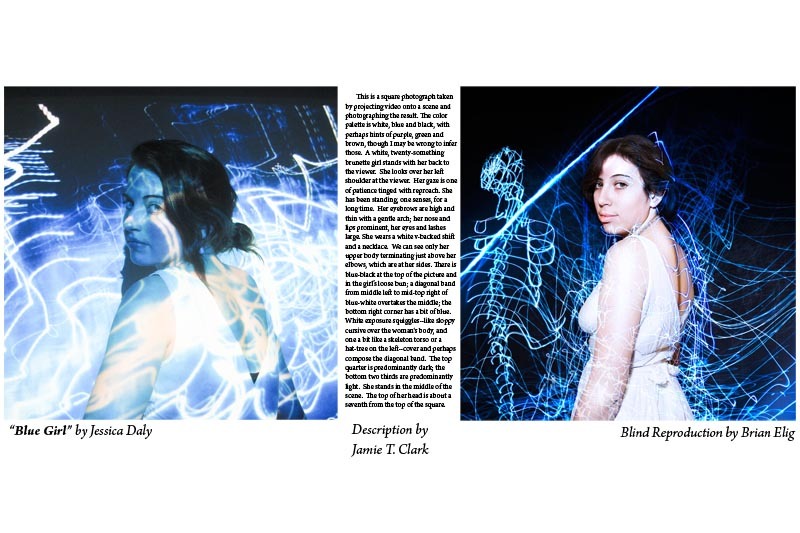 Blue Girl: original by Jessica Daly, description by Jamie T. Clark, and blind reproduction by Brian Elig. Signed by Daly and Elig. 19 x 13 inch archival print. 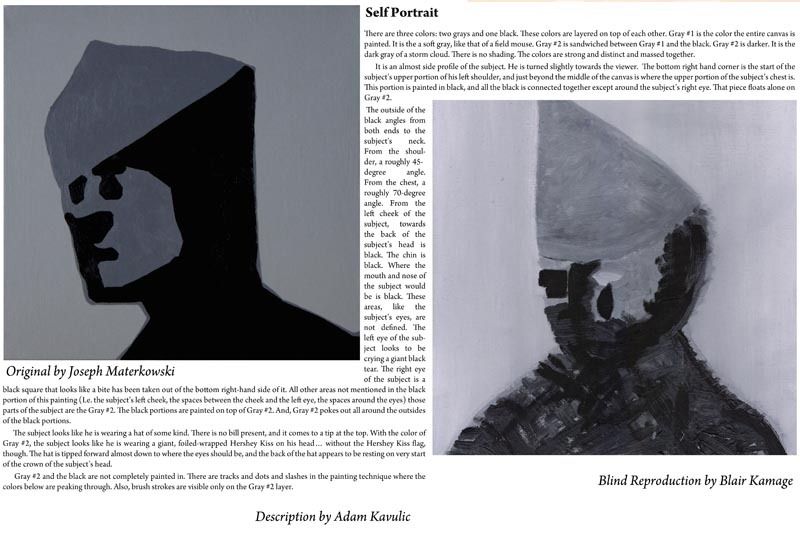 Self Portrait: original by Joe Materkowski, description by Adam Kavulic, and blind reproduction by Blair Kamage. Signed by all three. 19 x 13 inch archival print. 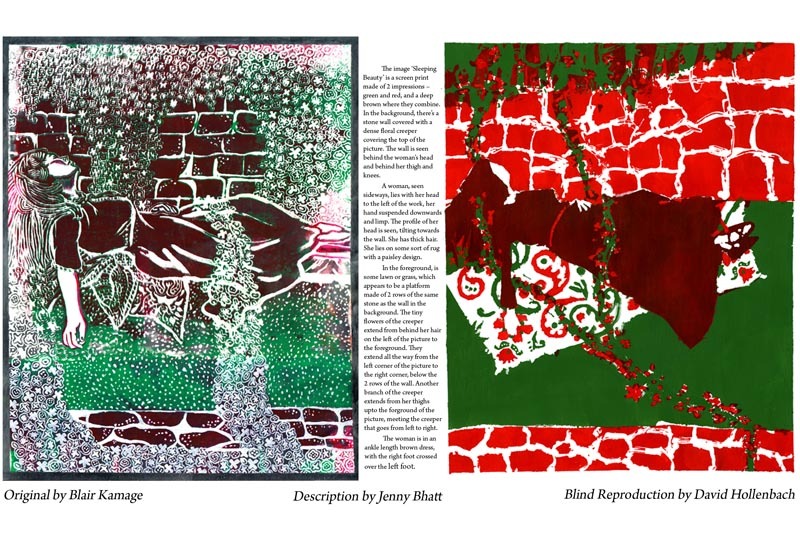 Sleeping Beauty: original by Blair Kamage, description by Jenny Bhatt, and blind reproduction by David Hollenbach. Signed by Kamage and Hollenbach. 19 x 13 inch archival print. 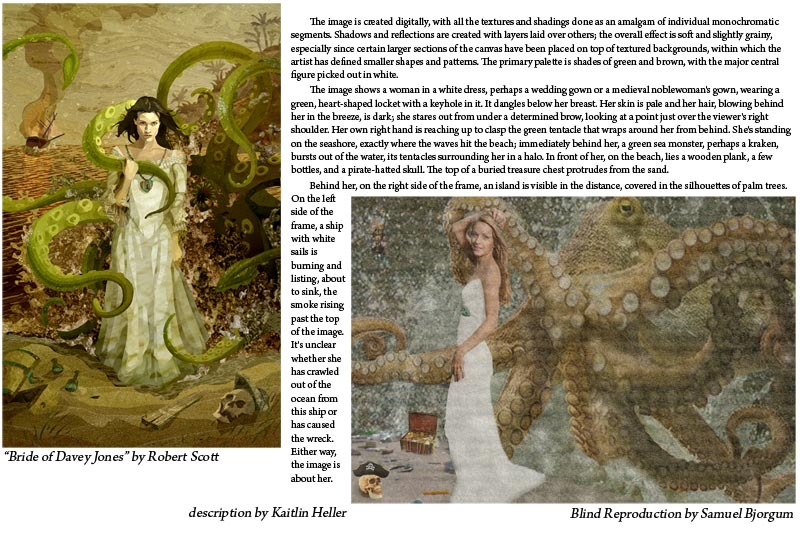 Bride of Davy Jones: original by Robert Scott, description by Kaitlin Heller, and blind reproduction by Samuel Bjorgum. Signed by Scott. 19 x 13 inch archival print. 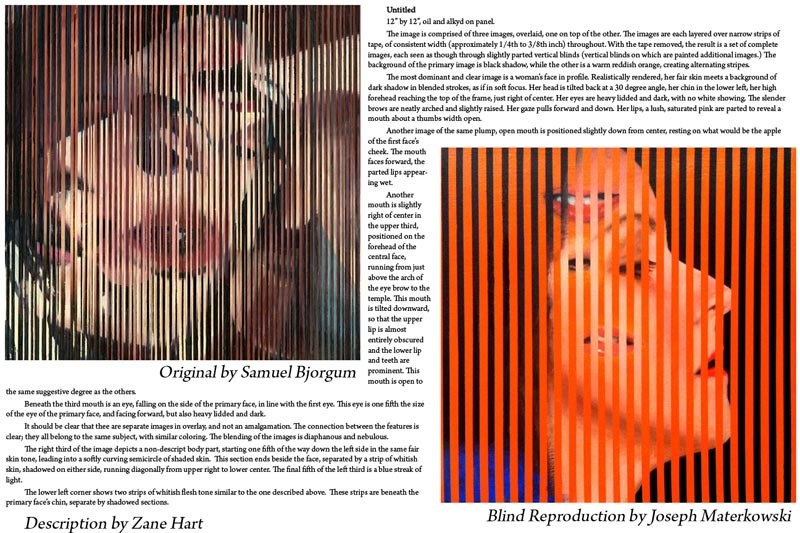 Untitled: original by Samuel Bjorgum, description by Zane Hart, and blind reproduction by Joe Materkowski. Signed by Hart and Materkowski. 19 x 13 inch archival print. 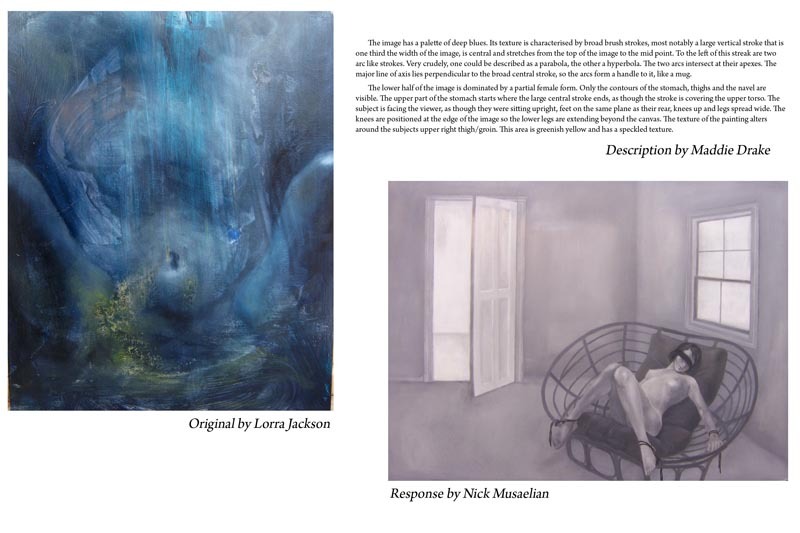 original by Lorra Jackson, description by Madeline Drake, and blind reproduction by Nick Musaelian. Signed by Jackson. 19 x 13 inch archival print.